The latest market report by PMR on the global herbicide safeners market evaluates the opportunities and current market scenario, and provides insights and updates about the corresponding segments involved in the global herbicide safeners market during the forecast period 2018-2027. The global herbicide safeners market report further exhibits the estimated data for 2018, and forecast data up to 2027 in the terms of value (US$ Mn) and volume (MT). In the terms of value, the global herbicide safeners market is expected to grow at a CAGR of 5.7% over the forecast period. 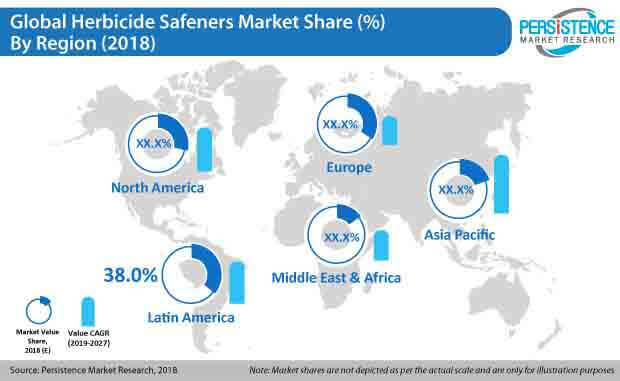 The present study exhibits the trends and market dynamics of the herbicide safeners market in five major regions - North America, Latin America, Europe, Asia Pacific, and the Middle East & Africa. The report also includes the study of the current issues with consumers, and various future opportunities for the herbicide safeners market. The report explores the global herbicide safeners market for the period 2018–2027. The primary objective of the global herbicide safeners market report is to provide insights into the opportunities in the market that are consistently supporting the transformation of global businesses that are associated with herbicide safeners. It is very important to consider that, in an ever changing economy, we provide the estimated (Y-o-Y) year-on-year growth rate in addition with the Compound Annual Growth Rate (CAGR) for the overall forecast, to better understand the analysis and evaluation of the global herbicide safeners market, and to discover equitable opportunities. Yet another key feature of this report is that, the estimation of the global herbicide safeners market and the corresponding revenue forecast are carried out in terms of absolute dollar opportunity. This is usually not prioritized while forecasting the overall market numbers. Absolute dollar opportunity analysis is very essential in evaluating the degree of opportunity that a provider can observe to execute, as well as to contrast the potential resources from a sales perspective in the global herbicide safeners market. The global herbicide safeners market report starts with an elaborated executive summary, the market definition of various segmentations that are included, and their respective shares in the global herbicide safeners market. The report further incorporates the major macroeconomic factors that have an effect on the growth of the herbicide safeners market. The market report also highlights various market dynamics, which includes the drivers and restraints in the global herbicide safeners market. Current opportunities as well as on-going trends in the herbicide safeners market are also discussed in this report. The report further underlines the study of the present issues with industrial processing, and opportunities for the herbicide safeners market. It also encompasses a supply chain analysis, which provides a structural view of the overall profitability from the manufacturer to the end user in the herbicide safeners market. In order to provide users with a clear view of the global herbicide safeners market, we have exhibited a competitive analysis of key market players and their strategic expansions. The competitive dashboard presents a detailed comparison of herbicide safener manufacturers on valuable parameters such as key product offerings, total revenue, key developments, and key strategies. The study intensifies the global herbicide safeners market attractiveness analysis by type, application stage, crops, and region. To evaluate the overall market size of herbicide safeners, the report considers various fundamental aspects based on secondary research. Furthermore, it emphasizes quantitative evaluation such as market shares by type application stage, crops, and region, and other qualitative data from primary respondents, which have been consolidated to arrive at clear and accurate market estimations. The market size was benchmarked taking into consideration the share of global arable land. The global use of herbicides was deduced by splitting the global use of pesticides obtained from sources such as FAO. The average use of specialty crop protection products, deducted from company revenue, was used to triangulate the process. The forecast presented in the herbicide safeners market report arrives at the total revenue being generated, and expected revenue contribution in the future by the global herbicide safeners market. Detailed profiles of companies that manufacture herbicide safeners are included in report to analyze their developmental strategies, key product offerings, and recent developments, as they have a significant role in the global herbicide safeners market. Market players covered in the herbicide safeners market report are DowDuPont Inc., Sygneta AG, UPL Limited, BASF SE, Nufarm Ltd, Merck KGaA, Sipcam Agro, Drexel Chemical, Adama Agricultural Solutions, WinField Solutions LLC, Bayer, and Helm AG, besides others. Increasing developments and emerging technologies across the globe have changed the face of the agricultural sector. There has been an emergence of several markets in the agricultural sector, with the increasing demand for food being the prominent driver. Reducing arable land and decreasing resources have increased the pressure on the supply-demand chain in the agricultural sector. This has led to the emergence of innovative crop protection products in order to secure agricultural produce. Changing climatic conditions and environmental status, as well as increasing emergence of various weeds and herbs have had a negative impact on the quality as well as yield of crops. Thus, there has been an increase in the demand for several crop protection products such as herbicides and herbicide safeners. Herbicide safeners are chemicals that are used as herbicide antidotes. Herbicide safener chemical agents increase the tolerance of cereal plants to herbicides without having an impact on their weed control ability. Herbicide safeners work by inducing certain genes in crops that increase the production of an enzyme that takes part in herbicide detoxification. Thus, herbicide safeners help protect crops from damage caused by herbicides. The global herbicide safeners market is expected to create an attractive absolute dollar opportunity of around US$ 514.5 by 2027 over 2018. The benoxacor segment, under type, is expected to exhibit a high growth across segments in the global herbicide safeners market. Latin America is currently a prominent region, and is expected to have a high market share in the global herbicide safeners market over the forecast period. However, Asia Pacific region is expected to grow at a high pace in the herbicide safeners market over the forecast period. By type of herbicide safeners, the benoxacor segment is expected to a prominent segment as compared to the other types of herbicide safeners, owing to its increasing use in herbicides for soybean, corn, and sorghum. By application stage of herbicide safeners, the pre emergence segment is expected to be a prominent segment in the global herbicide safeners market, with its increase in seed treatment as well as multiple benefits such as lesser hazards and ease in application. By crops, the maize segment is expected to have a prominent share as compared to other crops in the global herbicide safeners market over the forecast period. Soybean is expected to be another crop that has a good absolute dollar opportunity in the global herbicide safeners market. The growing demand and production of soybean and maize in one of the factors having a positive effect on the global herbicide safeners. The growing demand for crop protection and care products is one of the direct drivers for the herbicide safeners market. As the world’s population continues to grow, the amount of land available for food production is reducing. As such, the increasing attempts to achieve higher yield are proving to be an important driver of the global herbicide safeners market. The increasing use of concentrated herbicides is having a negative impact on crop produce and quality, as herbicides damage the crops along with the weeds. Thus, herbicide safeners are increasingly gaining popularity. There has been an increase in the use of herbicide safeners for crops such as soybean, maize, rice, wheat, sorghum, and barley. The growing cultivation of these crops is proving to be one the major drivers for the global herbicide safeners market. The evolution of herbicide-resistant species has led to the development of newer and stronger herbicides, leading to the increased used herbicide safeners in order to protect crops. Currently, herbicide safeners are effective just for monocot plants. The effectiveness of herbicide safeners on dicots is still unknown, and is a factor that is hindering the herbicide safeners market from reaching its full potential. Rising environmental safety concerns about the use of herbicides as well as strict regulations by governments in many countries are some of the factors that are restraining the market. The global herbicide safeners market has been regionally segmented as North America, Latin America, Europe, Asia Pacific, and the Middle East & Africa. Latin America current holds a large share in the global herbicide safeners market. Latin America is expected to be a prominent region over the forecast period in the global herbicide safeners market. North America follows Latin America in terms of value share in the global herbicide safeners market. Asia Pacific is expected to grow at a rapid pace with a high CAGR of about 8.5% from 2019-2027 in the global herbicide safeners market, owing to the increasing cultivation of wheat, rice, sorghum, and maize crops in the region. Europe is expected to show steady growth, being a mature market. The Middle East & Africa is expected to have a lower share as compared to other regions, owing to lesser agricultural activities in this region. Thus, considering all the factors, the global herbicide safeners market is expected to grow positively in terms of value and volume over the forecast period.